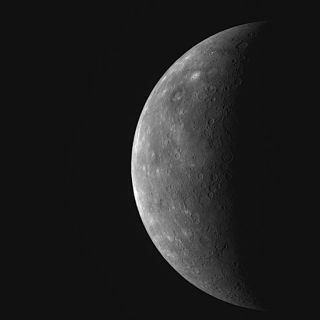 This WAC image shows portions of Mercury's surface that had remained unseen by spacecraft even after the three flybys by Mariner 10 in 1974-75 and MESSENGER's two earlier flybys in 2008. In this image, the newly imaged terrain is located in a wide vertical strip near the limb of the planet (on the left side of Mercury’s partially sunlit disk). NASA will hold a press conference today (Sept. 29) to unveil the latest discoveries on Mercury by a spacecraft orbiting the small rocky planet. David Blewett, Messenger participating scientist and staff scientist, Johns Hopkins University Applied Physics Laboratory (APL), Laurel, Md. An artist's interpretation of NASA's Messenger spacecraft arriving in orbit around Mercury on March 17, 2011. NASA's $446 million Messenger mission to Mercury launched in 2004 on a 6 1/2-year journey to innermost planet. The spacecraft's name is short for the bulky moniker MErcury Surface, Space ENvironment, GEochemistry, and Ranging. Since entering orbit around Mercury, the Messenger has been continuously snapping photos of the planet's stark, rocky surface, as well as using other instruments to study the planet's interior and tenuous atmosphere. NASA will post information on how to listen in on the Mercury teleconference today here.